A great simple design, perfect for all of your outdoor storage needs within your garden. If you require storage with minimal fuss at a price that you justify then this may be just the one for you and your family. 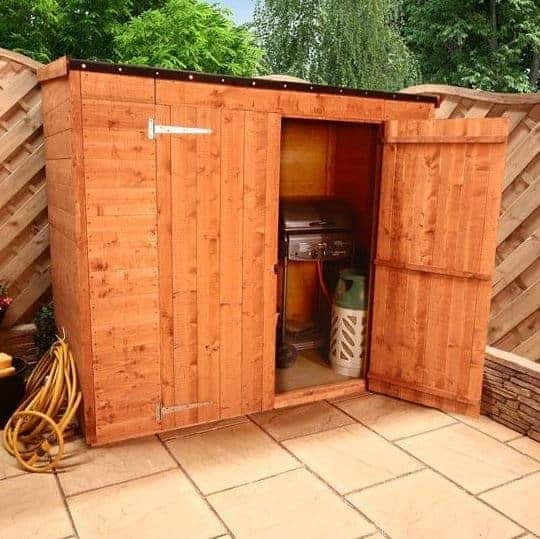 Now you need never worry again about where you are going to store the BBQ! 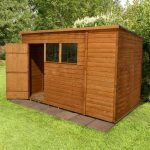 Or choose this shed for storing lots of small outdoor items – this is an excellent space saving storage unit suitable for all gardens. Also a great choice as a secondary building it is easy to get to your stored item as the large double doors swing open to reveal almost all of the interior space. Crafted from long lasting and hard wearing wood and with classic tongue and groove cladding it’s an attractive looking building and makes a superb small storage solution. The interior space may be personalised with free-standing shelving and hooks to accommodate all of your outdoor equipment, garden accessories, toys and furniture, keeping them neat and tidy for easy accessibility for the whole family. 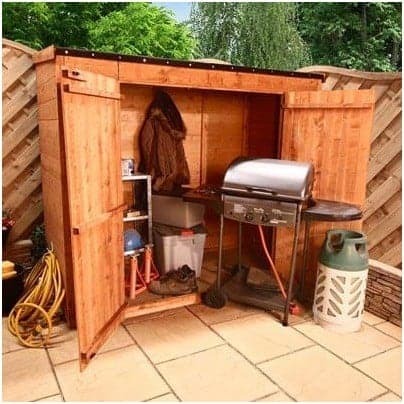 Due to its size, this shed would be fantastic for smaller gardens, keeping all of your belongings protected from the weather outside and out of sight. We understand that choosing a new shed can be a daunting process, especially as there are just so many to choose from. Here at whatshed.co.uk we try to make things easier for our customers by highlighting and analysing features that may be of interest. Size: Although on the smaller side, the shallow interior proves to be somewhat beneficial as you can access all of your items very easily, without even stepping into the shed itself. 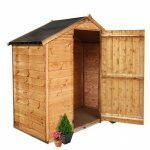 Perfect for smaller gardens, this shed takes up minimal space whilst offering maximum storage potential. Interior: The interior allows enough space for the average household’s storage for all of their outdoor equipment, garden toys and furniture. 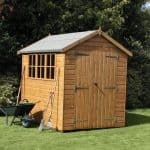 The shed provides fantastic storage opportunities for all of your garden equipment. There is potential to add free-standing shelving, drawers and hooks to utilise all of the floor and wall space fully, allowing storage of items both large and small, and keeping everything neat and tidy. 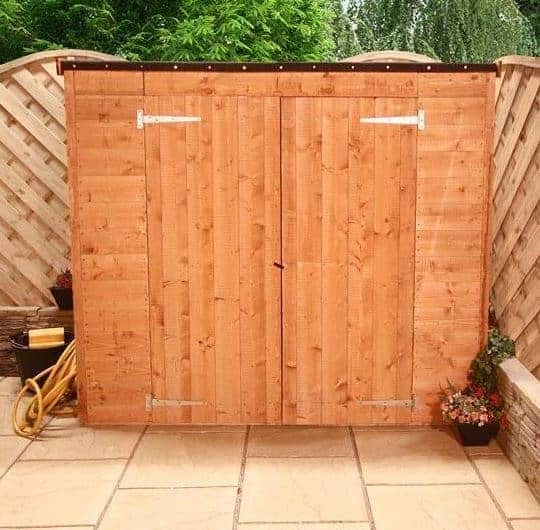 Doors: The wide doors are great for storing larger items such as bikes, trampolines and similar items, allowing for a full view of the entire contents of the shed when opened. Security: When storing expensive tools and garden equipment we understand that you would like the peace of mind that your items are stored securely. The shed does not come with a security fixture or lock, however if this is something you may be interested in then the BillyOh padlock and hasp are available to buy separately at a modest price and other security measures are available to buy should you be after something different. The Billyoh Mega Store Tongue and Groove Pent Garden Storage Unit: How easy to build? Your new shed will arrive flat-packed with a complete fixing kit provided for your convenience. A basic tool kit is all that is required for assembly and should expect to be completed within a couple of hours. BillyOh will provide your shed packed in easy-to-manage pieces, great for the individual looking to erect the shed on their own. If time is an issue or you have very little DIY experience, it may be advisable to enlist the help of a second person to make your life a little easier. The Billyoh Mega Store Tongue and Groove Pent Garden Storage Unit: What is the overall quality like? This shed is everything you could want from a garden storage facility, looks and quality of design. If you are looking for an unobtrusive storage solution for all your garden and outdoor equipment, then this could be the right shed for your needs. The thick timber provides a strength that will protect all of your belongings, keeping them dry and secure from harm. 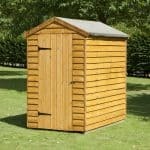 A fairly inexpensive shed for the price, this great sized shed is perfect for those looking for a reliable storage solution within a smaller garden. Virtually maintenance free, should you ever have the need to clean your shed then a simple hose down with water or spot-clean with a sponge should suffice. To aid transportation and to prolong its life your shed will be pre-treated with a timber preservative treatment. 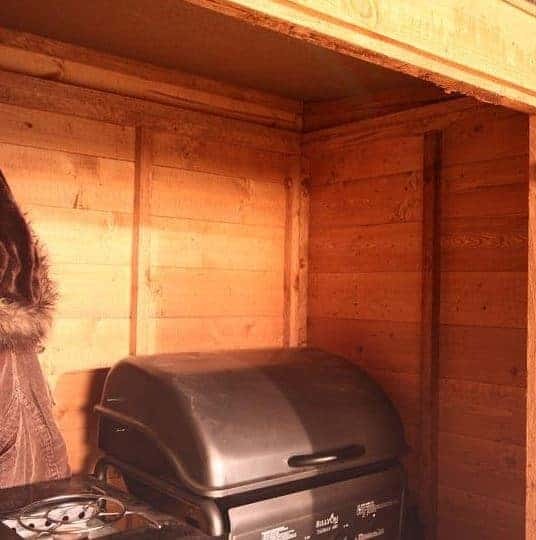 Due to its finish, your shed will continue looking smart with a vibrant colour exuding from the exterior for many years to come in your garden. 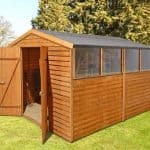 A classic design shed with a pent roof, which can offer a fantastic solution to your garden storage needs. Whatever you wish to store, the large doors make it the best choice for both large and small items and tools, for use by the whole family. 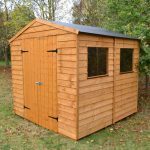 At a lower-range price point for sheds, we think this is great value for money considering the many opportunities for storage, both on the floor and on the walls.